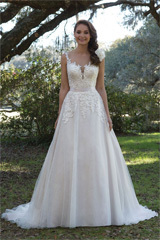 The Sweetheart collection by Justin Alexander blends all of the best in current bridal trends – modern chic, beautiful illusion backs, fun and flirty skirts. The affordable Sweetheart wedding dresses are the sweetest dream come true for value-conscious brides. Chic designs, affordable prices, and quality fit! Ready to jump into these gorgeous Sweetheart dresses?